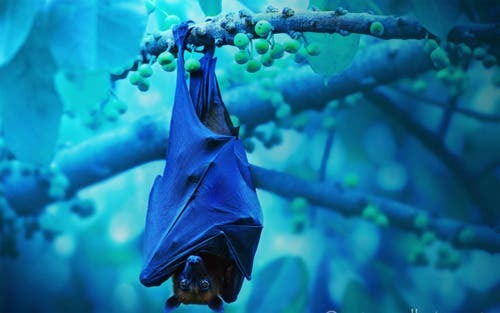 The bat is the only flying mammal and among the heaviest in the world. To top it over, it can land upside down a perplexing acrobatic feat which has left scientists scratching their heads for many years. After carefully and systematically studying bat upside landings in slow motion, a group of researchers thinks it has cracked the puzzle: bats employ a nifty trick where one wing stays flapping while the other is moved close to the body. This asymmetry corrects the moment of inertia and center of mass so the bats always land safely upside down. Birds have it easy. Their bones are hollow and the wing mass/body mass ratio is very small. Bats on the other hand have the bones as other mammals, albeit smaller and more delicate. These are covered in muscles, joints, tendons and skin, which means bats have the highest wing mass/body mass ratio. This doesn’t seem to bother them too much, given they’re excellent flyers. Yet these characteristics should have made it difficult for the bats to perform their most delicate maneuver: landing upside down. When bats come in for a landing, they slow down which should make it harder for them to re-orientate themselves. Researchers at Brown University were fascinated by this and decided to investigate. They trained two bats to land upside down on a mesh attached to the ceiling, while recording to whole process. “We analyzed the video in a very sort of quantitative manner to create a digital version of the bat that is moving. We know all of its angles, the joint angles and wing postures. What they were doing was moving their wings in very characteristic ways in order to manipulate their center of mass and the moment of inertia,” said Kenneth Breuer, from the university’s School of Engineering. It seems the bats have turned their cumbersome wings into an advantage. Fractions of a second before landing, the bats pull one wing closer to their body while the other is fully extended. By quickly shifting their weight, the bats are exploiting their large wing mass. Effectively the bats are using inertia, just like a figure skater might hold his arms closer to the body to pick up speed. To confirm this hypothesis, the Brown University researchers made a computer model which mimicked the bats movements. By switching aerodynamic forces or inertia on and off, they could study how the bats would land. When only the bat’s aerodynamics were factored, it couldn’t land upside down as reported in PLOS Biology. Did the bats evolve these heavy wings to land upside down or is the upside down landing just a convenience? It’s hard to tell at this point, given bats evolved from non-flying mammals. “If we had a time machine and could return to earth in another hundred million years, we might see even lighter wings in bats,” says study co-leader Sharon Swartz, a professor of biology, for National Geographic.